MARIO CALDERARA & UMBERTO SAVOIA In those months (summer 1908) Wilbur Wright had been invited to visit France and had been demonstrating the potentialities of his marvelous "Flyer" which could carry out extended flights with a duration of thirty to sixty minutes, while the French airplanes manufactured by Blériot, Voisin and Farman could only stay in the air for a few minutes. The Italian Aeroclub, acting in coordination with the Italian army's "Brigata Specialisti" headed by major Maurizio Moris, invited Wilbur Wright to Rome and offered to purchase one of his airplanes. Wilbur Wright was asked to train one or two Italian pilots on the fields of Centocelle (Rome's future airport). Mario Calderara was selected as the first trainee, because he was the only person in Italy with the required references. 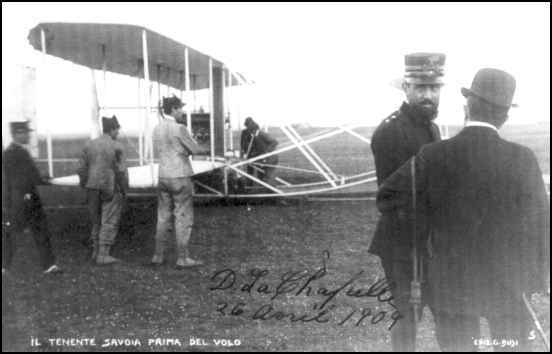 Wilbur Wright came to Rome in June 1909 and , after having carried many VIPs as passengers on his machine, gave a few lessons to Mario Calderara and, in the last days, to army lieutenant Umberto Savoja, of the corps of engineers. Wilbur Wright left for the United States on May first, stating that Mario Calderara was in a position to fly alone and to teach flying to lieut. Savoja. After his departure, Mario Calderara made many prolonged flights without any problems, but on a windy day, on May 6th, his airplane crashed and he was seriously wounded (concussion of the brain). After recovering in the hospital, he managed to repair the Wright airplane with the assistance of Umberto Savoia, who was a very good engineer, and after a month and a half (July l909) he resumed the flights in Centocelle. In September 1909, the Aeroclub of Italy called for an international air rally in Brescia (a similar rally had taken place in Reims, France, in July). Calderara was allowed to participate in this competition, which would be attended by King Victor Emanuel in person. Three weeks before the rally, a violent tornado destroyed the canvas hangars built on the Brescia airport for the participants, and the Wright flyer which had been already rebuilt in Rome was damaged beyond repair. The two officers ( Calderara and Savoja) managed to rebuild the biplane in 9 days, using second quality wood and canvas, in time for the rally. 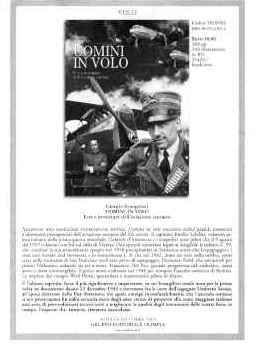 Via email from Bob Davis - 9-2-03 "The death of Lieutenant Vivaldi, who was killed today by a fall from his aeroplane has caused deep and general sympathy, he being the first Italian victim of aviation. Lieutenant Vivaldi was a member of a noble Genoese family and had the title of marnis. He was a brilliant calvary officer. He took his certificate as an aviator at Charlons-Sur-Marne, and having purchased a Farman biplane, made his first flight with it today. 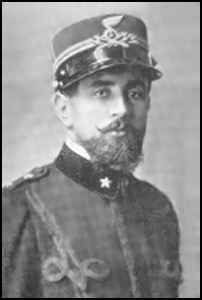 He was accompanied by Lieutenant Savoie, (Umberto Savoja? ),one of the Wright pupils. Vivaldi soon took the lead and was returning alone to Rome when the accident to his machine occurred. It is believed that the motor stopped on account of lack of petrol and the aviator, not yet an expert at planning, lost control of the machine. He fell from a great height and was badly crushed." ONLINE RESOURCES - I Using the Google search engine, on the name Umberto Savoja, you will find some 34 links to sites referring to him. Most of them are written in Italian, but are machine-translatable directly from the results of the search. 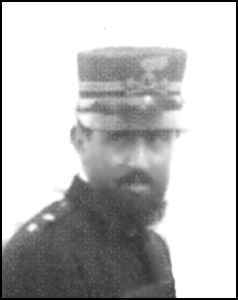 UMBERTO SAVOJA This webpage, which is found on the Aeronautica Militare website, offers a concise biography of Samoja and carries a small portrait of him in military uniform. A copy of the image may be seen at the top of this page. You can access it, in machine-translated English, by clicking on the title above. ONLINE RESOURCES - II If you search for "Umberto Savoia +aviation" using Google, (9-8-03), you will find about nine links. Some of them are in English, others in Italian. One of the most interesting is the following. SAVOIA - MARCHETTI This webpage on the Centennial of Flight website offers a very complete story of the company which was founded by Umberto Savoia and chief designer Alessandro Marchetti in 1915. It is illustrated with four photographs which are capable of being enlarged. To read the whole story, click on the title above. Giorgio Evangelisti (Bologna, 1933) is an airplane and glider pilot. A journalist since 1958, he has to his credit banns of aeronautical argument on daily paper and Italian and foreign specialistic reviews. In 1968 he was awarded the "Mario Massai" Prize for his contribution to the spread of aeronautics and the idea of the flight. The book, written in Italian and containing 112 pages, may be obtained from Editoriale Olimpia. Centocelle - Rome, April 26, 1909 before a flight with Wilbur Wright.